Earth Rangers is the kids’ conservation organization. Our programs are based on research that indicates that the number one environmental concern for children across Canada is protecting animals from extinction. We believe that when children learn about the threats facing animals and their habitats, they are eager to help, but don’t always know how they can make a difference. That’s where Bring Back the Wild comes in. Bring Back the Wild educates our members on the importance of protecting animals and empowers them to take action by starting a fundraising campaign. Each year, we work with our conservation partners to identify four unique Canadian species that are facing threats in the wild. We then develop projects to protect those animals, ranging from conservation research, to land acquisition, to habitat stewardship. After learning about each project, our members can choose one of the four species that they’d like to support with their fundraising campaign. Bring Back the Wild provides the tools needed in order to make a tangible contribution through fundraising. Throughout the year, members are provided with updates on the project, ensuring that they know how the donations they raised were used and what was accomplished with them. To date more than 300,000 kids have worked together to raise over $2.1 million for Bring Back the Wild conservation projects. • 50% of the funds raised support research and the protection and stewardship of animal habitats in Canada. • 50% supports our education program (animal care, training and education programming) enabling us to bring our program, including live animal presentations and curriculum resources, to schools across the country free of charge. Click the map to see the locations of our conservation projects. There are 21 species of salamander that are native to Canada, and 10 of these can be found in Covey Hill, Quebec. Covey Hill is one of the most unique habitats in all of Canada, and it’s really important that we protect it to make sure that all 10 of its salamander species will have a safe place to live. Earth Rangers and The Nature Conservancy Canada (TNC Canada) have been taking action to protect Salamanders by protecting 148 acres of peat bog in Covey Hill, Quebec, where they live, and working to increase the amount of habitat protected in this biodiversity hotspot to over 1,000 acres. No bigger than the average housecat, and with an amazing ability to climb trees, the Gray Fox is one of the most unique members of the dog family – and sadly one of the rarest mammals in Canada. Habitat loss on its Pelee Island home is making it harder for the Gray Fox to find food and shelter. Earth Rangers and the Nature Conservancy of Canada have been protecting the Gray Fox by improving habitat on Pelee Island, creating ideal habitat for gray foxes to hunt and make their dens, and removing invasive species like garlic mustard and common reed that are overtaking the native plants important to the gray fox's diet. Pine Martens are built for life in the forest. Their long tails keep them balanced as they jump from branch to branch, and their sharp claws grip tree bark so they can climb to the highest heights without falling. Unfortunately, these tree-jumping superstars are facing serious threats, like habitat loss. Earth Rangers and The Nature Conservancy Canada (TNC Canada) have been taking action to protect pine mMartens by identifying and protecting the old growth forests where they live, and working with local industries to make sure wood isn’t harvested from critical pine marten habitat. Woodland caribou are the biggest members of the caribou family. They stand almost 5 feet tall at their shoulders – add on the height of their antlers and you’ve got one massive animal! Unfortunately, woodland caribou are facing serious threats, like habitat loss. Earth Rangers and the Pembina Institute have been protecting woodland caribou by working with conservation groups and First Nations communities to identify priority conservation areas and supporting the Government of Alberta in their commitment to protecting almost 20% of the province’s land and freshwater habitats. No matter how long you can hold your breath, it doesn’t come close to a painted turtle! Painted turtles hibernate underwater and can hold their breath for up to five months! Unfortunately, painted turtles are facing some serious threats, like habitat loss. Earth Rangers and the City of Toronto teamed up to help protect these turtles. We have been hard at work laying out the plans for lots of habitat restoration on Toronto Island. The Eastern Small-footed bat is the smallest bat species in eastern North America. They weigh 4-5 grams (about the same as a nickel) and are about 8 cm long (a little bit shorter than the long side of your official Earth Rangers card). Unfortunately, they are facing serious threats, like the spread of white-nose syndrome. Earth Rangers and the Ontario Ministry of Natural Resources and Forestry have been hard at work protecting Eastern Small-footed Bats by tracking populations in Ontario and looking for the critical habitat sites these bats use for roosting. Bees are the top pollinators in Canada and one of the most important groups of pollinators on Earth. Among the thousands of plant species they’re responsible for pollinating are a number of food crops that we enjoy every day, like apples, sweet potatoes, and watermelon, just to name a few! Unfortunately, bees and other pollinators are facing many challenges to their survival. Earth Rangers and Pollinator Partnership are working hard to protect bees and other pollinators by identifying the plant species used by different pollinators (like bees and butterflies) across Canada to develop guides that will help people across the country plant successful pollinator gardens. A conservation project with the Pollinator Partnership Canada. Wolverines are listed as threatened in Ontario and there may be fewer than 1000 left in the province. They’re facing serious threats like habitat loss, being hit by cars and accidentally getting caught in traps set for animals that aren’t at risk. Earth Rangers and WCS Canada have been working hard to protect Wolverines by studying them and their habitat. We’ve also been working with registered trappers to test tools and techniques to prevent Wolverines from getting trapped. Peregrine Falcons almost completely disappeared from Canada in the 1950s and 1960s. Since the banning of DDT in Canada in 1972, Peregrines have made an amazing comeback but they’re not out of the woods yet. They’re still facing serious threats like habitat loss, nest disturbance and deadly collisions with buildings. Earth Rangers, the Nature Conservancy of Canada and FLAP have been taking action to protect Peregrines by studying and identifying their nest locations, rerouting trails away from their nests, promoting bird-friendly building designs and encouraging people to turn their lights off at night. Little Brown Bats have an uncertain future as they face a deadly disease called White-nose Syndrome. This disease, caused by a fungus, has killed millions of bats and has wiped out entire colonies throughout eastern North America. Earth Rangers and the Ontario Ministry of Natural Resources and Forestry have been working to protect Little Brown Bats by studying them to learn more about their critical habitats. This information is being used to help design bat boxes that can be cleaned, removing any of the fungus that causes White-nose Syndrome and stopping it from spreading. Coral isn’t just found in tropical waters, we have some right here in Canada! These Cold-Water Coral are facing serious threats like climate change and harmful fishing practices such as bottom trawling. Earth Rangers and Arctic Fishery Alliance have been working to protect these coral by conducting underwater surveys in the waters surrounding Qikiqtarjuaq and at the Mouth of Eclipse Sound, both located in Nunavut. A lot about Cold-Water Coral is still unknown and these surveys will help us learn where they live so we can better protect their habitat. A conservation project with the Arctic Fishery Alliance. Bobolink populations have dropped significantly throughout North America since 1968. This is largely due to the grasslands where they nest becoming land for houses or large scale farming operations. Earth Rangers and The Couchiching Conservancy took action to protect bobolinks by restoring important grassland breeding habitats, conducting surveys on populations and nests, and purchasing geolocators to study bobolink migration. This project also supported Regroupement QuebecOiseaux’s efforts to educate farmers on ways to protect bobolinks if they nest on their land. As little as 35 years ago there were no swift foxes left in the wild in Canada. Today, thanks to a lot of hard work, their populations are returning. Unfortunately, they are still listed as threatened in Canada as they face serious threats like grassland habitat loss, as well as trapping and hunting. Earth Rangers and the Calgary Zoo helped protect the swift fox by purchasing cameras that researchers use to study the habitats where these foxes raise their young. This information will be used to find better ways to protect swift foxes and the habitats where they grow up. For eastern wolves living in Ontario, habitat loss and degradation from equipment noise and pollution are major threats to their survival. Their population numbers are so low that there are believed to be fewer than 1,000 eastern wolves left in Canada. Earth Rangers and Dr. Brent Patterson from the Ontario Ministry of Natural Resources teamed up to help eastern wolves by purchasing seven GPS satellite collars to study the wolves’ movement patterns, distribution and habitat use. This information will be used to learn more about eastern wolves in Ontario and find better ways to protect them. Fewer than 500 western screech owls are left in Canada. Key threats to their population include forest habitat loss due to development, large-scale agriculture and hydroelectric projects. Earth Rangers teamed up with the Nature Conservancy Canada to protect western screech owls by collecting important information about population size and studying their nesting habits. Thanks to the donations raised for this Bring Back the Wild project, the Nature Conservancy of Canada was able to conduct over 90 surveys. The information from these surveys will be used to support conservation efforts for western screech owls. The early melting of arctic sea ice means more ships are travelling through the arctic than ever before. Scientists believe that noise pollution from these ships may be affecting the beluga’s ability to communicate with one another, find food, raise their young and detect predators. Earth Rangers, the Department of Fisheries and Oceans, the University of Manitoba and Churchill Northern Studies Centre helped protect the beluga whale by purchasing special underwater recorders to measure the effects of boat noise on their natural behaviours. This project also supported conservation research and helped scientists study how environmental changes, like contaminants, affect beluga whale health. Blanding’s turtles are losing the wild spaces they need to make their homes and what habitat remains is being divided by land and road development. To make matters worse, Blanding`s turtles are also in danger from poachers who are removing them from their homes in the wild and illegally selling them as pets. Earth Rangers and the Toronto Zoo teamed up to help protect the Blanding’s turtle. This Bring Back the Wild project supported a head-starting program at the Toronto Zoo, which raises young turtles indoors and releases them into the wild as soon as they are able to survive. The destruction of old barns, use of pesticides and climate change are all threats affecting barn swallows. With fewer places to call home, barn swallows are slowly disappearing from our forests and woodlands. Earth Rangers and the Nature Conservancy of Canada helped protect the barn swallow by rebuilding barns and protecting land at Covey Hill and Île de Grâce, Quebec. This project also supported research conducted by Bird Studies Canada on barn swallow usage of artificial nest boxes. Bees are disappearing fast and we need more scientific research to figure out how we can help them. Habitat loss, disease and pests, pesticides, invasive species and climate change are all making it difficult for these important pollinators to thrive. Earth Rangers and Dr. Cory Sheffield, from the Royal Saskatchewan Museum, helped protect the Western bumble bee by funding research to better understand bees and learn more about the number and variety of bees in western Canada. This conservation project also created awareness about the vital role bees play. Earth Rangers, The Nature Conservancy of Canada and researcher Josh Sayers helped protect the American badger in Southern Ontario by removing invasive plant species and rehabilitating grassland habitat. Through field restoration and the creation of sand ridges the project helped improve the American badgers' ability to find food and build dens. This project also funded the placement of radio transmitters on several American badgers to better understand their movements, habitat preferences and behaviours. Over eight thousand campaigns were started by children passionate about protecting the American badger and together they supported conservation work while increasing awareness about the need for environmental protection. Oregon spotted frogs are the most endangered amphibian in Canada, within its limited range in southwestern British Columbia fewer then 300 breeding adult females remain. This drastic population decline is caused by such threats as habitat loss and the presence of invasive species, like bull frogs. To help protect the Oregon spotted frog Earth Rangers and the Vancouver Aquarium worked together to reintroduce this species into protected habitat and raise awareness about amphibians at risk. Over 5,000 kids started fundraising campaigns to help protect the Oregon spotted frog. The donations they raised helped build a new breeding facility on the roof of the Vancouver Aquarium and supported the breeding and release of Oregon spotted frogs into the wild. This project also restored wetland habitat in eastern Fraser Valley in Aldergrove National Park, British Columbia, which will provide protected habitat for tadpoles to be released into. Since the early 1980’s, the conditions for polar bears in their arctic habitat has declined, largely due to climate change. The sea ice is breaking up earlier than normal and decreasing in coverage, which forces polar bears inland sooner in the year. Earth Rangers, the Churchill Northern Studies Centre and researcher Dr. Nick Lunn worked together to protect the polar bear by supporting scientists conducting research in western Hudson Bay. This project also purchased satellite collars that allowed researchers to track polar bears and learn more about how early melting sea ice impacts their offshore movement and survival. 22,000 kids, like Earth Ranger Elijah, started Bring Back the Wild campaigns to help protect polar bears; their efforts raised awareness about species at risk while providing support for critical polar bear research. Dozens of species of long distance migratory songbirds in Canada have experienced chronic, long-term, population declines. To help protect songbirds Earth Rangers, the Nature Conservancy of Canada and Bridget Stutchbury and her research team worked together to protect the wood thrush by conserving habitat and supporting migratory studies. 10,000 kids, including Earth Ranger Vanessa, signed up to protect the wood thrush. The funds they raised went to help the Nature Conservancy of Canada purchase approximately 25 acres of mature deciduous forest, providing critical habitat for many species including the wood thrush. Donations to this project also purchased 60 geolocators, which were used by Bridget Stutchbury and her team to study and track wood thrush migration paths to help us learn more about how to protect their breeding and wintering grounds. The plains bison once roamed the western prairies in the millions but by the late 1800s they had been hunted to near extinction. Today their populations continue to recover, that’s why Earth Rangers and the Nature Conservancy of Canada helped care for plains bison at Old Man on His Back Prairie and Heritage Conservation Area in Saskatchewan. Tons of Earth Ranger kids started Bring Back the Wild Campaigns to protect the plains bison. Their campaigns purchased hay to feed the bison during the winter months when snow cover prevents them from grazing. Donations also funded site maintenance, such as fixing fences. Take a look at the Old Man on His Back Prairie and Heritage Conservation Area with Earth Ranger Veronica who not only started a club to raise awareness about the bison but also took a field trip to visit them. Monarch butterflies are beautiful insects, known for their incredible migratory journey that takes them almost 5,000 kilometers. Sadly, environmental conditions and loss of breeding habitat pose serious threats to the Monarch. Widespread use of herbicide in North America kills Milkweed, a plant, which provides food for the Monarch caterpillars and nectar for the butterflies. To help protect the Monarch butterfly Earth Rangers and the Nature Conservancy of Canada preserved critical habitat in the Tall Grass Prairie in Manitoba. This area is filled with Milkweed and tons of wildflowers, providing a large open habitat for Monarchs and other at-risk species. Earth Ranger kids, like the Friends for Wildlife team, started Bring Back the Wild campaigns to help protect the Monarch butterfly. Their fundraising helped ensure Monarch butterflies have more protected habitat to call home while raising awareness about species at risk. Spotted turtles are losing their habitat, wetlands are disappearing as they are drained for development and degraded by the introduction of invasive species. These small reptiles with distinctive yellow spots are also put at risk by the pet trade as poachers take them out of the wild to sell in pet stores. To help protect the spotted turtle Earth Rangers and the Nature Conservancy of Canada launched a Bring Back the Wild project to raise support for removing invasive species from wetlands as well as getting habitat designated as Provincially Significant to keep it from being developed. The location of this work has to remain secret, to protect the spotted turtles from poachers. Earth Rangers kids, like Ethan, started campaigns to help support this conservation work, thanks to their fundraising efforts the spotted turtle has more protected habitat in Ontario. Newfoundland pine martens were historically trapped for their fur; a practice that was banned in 1934. Today Newfoundland pine martens are still being accidently caught in traps and snares, set to catch other animals. Threats from the fur trade combined with habitat loss, caused by large-scale logging, has caused Newfoundland pine marten populations to decline to 300-600. To help protect this curious and excitable mammal Earth Rangers and the Nature Conservancy of Canada funded expeditions into the Grassy Place in Newfoundland and Labrador. This conservation project assessed the area to develop a plan to protect the pine marten while also working to restrict trappers from accessing the Grassy Place. Earth Ranger kids, like Nasim, started Bring Back the Wild campaigns to help the pine marten. Their support raised critical funds that made this conservation project possible. The beautiful Great Bear Rainforest in British Columbia is targeted for development, which would destroy the homes for many species including the grizzly bear. That’s why Earth Rangers and the Nature Conservancy of Canada teamed up to protect this habitat. Earth Ranger kids, like this group of friends, started Bring Back the Wild campaigns to protect the grizzly bear. The funds they raised went to buy private land to protect this habitat and keep air traffic and other disturbances away. By protecting land in Ellerslie Creek in the Great Bear Rainforest, we helped provide critical habitat for grizzly bears and tons of other species like black bears, mountain goats, cougars and gray wolves. Peregrine falcons live all across the world, including coastal areas where they can hunt for their favourite meal, shorebirds. As beaches, like those found in the Upper Bay of Fundy, are increasingly disturbed by human activities, birds like the peregrine falcon face serious threats to their population. To help protect the peregrine falcon Earth Rangers and the Nature Conservancy of Canada hired Beach Rangers to parole the beach and educate visitors coming to the shorelines at New Brunswick's Chignecto Bay. Tons of Earth Ranger kids started campaigns to protect the peregrine falcon, their efforts helped ensure shore birds were better protected at Chignecto Bay. Jefferson salamander habitat is threatened by reckless off-roading and urban development. That’s why Earth Rangers and the Nature Conservancy of Canada built barriers and warning signs in Happy Valley Forest to prevent habitat destruction from off-roading and protect the forest. This habitat in Southern Ontario is a headwater region, meaning its creeks feed into both Lake Ontario and Lake Simcoe. The forest also provides habitat for over 100 species of birds, reptiles and mammals including the Jefferson salamander. Thousands of Earth Ranger kids, like Breanna, started campaigns to protect the Jefferson salamander. Their support raised funds to help take care of this critical habitat, providing undisturbed wooded areas and tree debris for the Jefferson salamander to build its home. This Bring Back the Wild project is generously supported by Waste Management. In Alberta’s Crowsnest Pass Earth Rangers and the Nature Conservancy of Canada purchased land to help protect wolverines and other local animals. Wolverines are wide-ranging carnivores that need space to roam. Increasingly major roads are cutting off their migratory routes; their populations are also susceptible to fur-trappers. Through purchasing land Earth Rangers and the Nature Conservancy of Canada helped expand the protected habitat that provides safe spaces for such species as the wolverine, grizzly bear, grey wolf and elk. 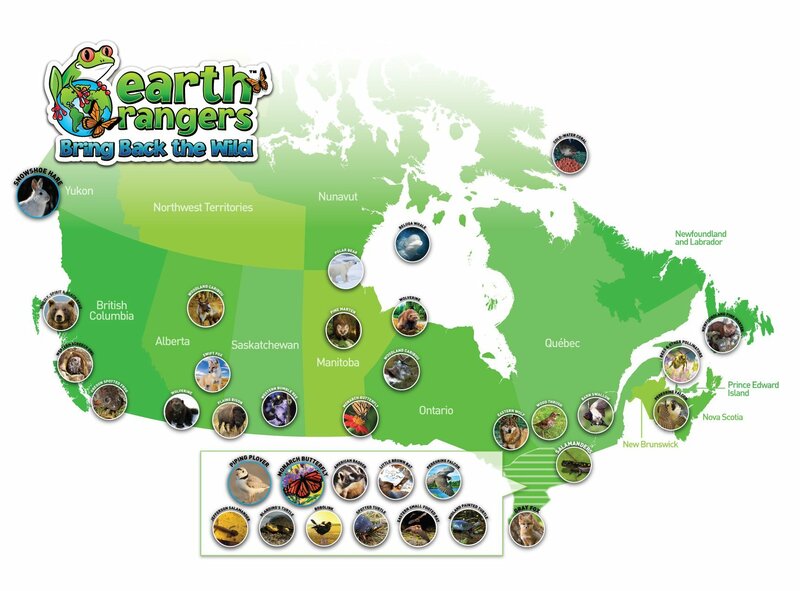 From September 2010 to August 2011 tons of Earth Ranger kids started Bring Back the Wild campaigns for the wolverine. Their contributions provided support for this conservation project while raising awareness about species at risk. Earth Rangers celebrates December by helping to protect one of the most iconic animals of the holiday season, the woodland caribou. You may know this species better by their European name, reindeer. In northern Ontario this species is called the woodland caribou and since 1880 they’ve lost 50% of their historic range. The wild spaces caribou need to survive are disappearing fast as industrial development and roads are built. Today there are about 5,000 boreal forest-dwelling woodland caribou left in Ontario. Earth Ranger kids, like Alex, have taken up the call to protect the woodland caribou, their Bring Back the Wild campaigns have supported the following projects. In partnership with CPAWS and CBFA, Earth Rangers worked to help conserve woodland caribou in Manitoba by supporting a traditional knowledge study with the Nelson House Cree Nation (NHCN) People. This study brought together the NHCN People, woodland caribou scientists, government officials and industries that are part of the CBFA. Together the project helped protect an estimated 4 million ha of caribou habitat and promote conservation education in Manitoba. Earth Rangers, Ontario Nature and the Conservation Boreal Forest Agreement worked together to support woodland caribou research. Bring Back the Wild campaigns for the caribou helped researchers conduct aerial surveys of caribou populations. These surveys assessed land usage of the woodland caribou, information that helped us better understand what areas of habitat are key to protect to best help the woodland caribou. Earth Rangers and the Wildlife Conservation Society helped protect the woodland caribou with the support of tons of kids who started Bring Back the Wild campaigns to raise support. Their fundraising efforts helped fund important research, allowing scientists to radio collar and track herds of caribou to better understand their movements. It is through critical research efforts like this that we can better understand animal behaviour and better protect species like the woodland caribou.